Mustangs & More offers Mustang restoration and classic car restoration for Kansas City and Merriam, KS. Mustangs & More keeps good company. Sometimes, legendary company. The Shelby Mustang to the right was restored by us and is a model show car that travels with BC Ethic clothing company. In the last few frames you can see Mr. Carroll Shelby personally signing the dash of this classic beauty. That's the kind of endorsement that car guys like us usually only dream about. 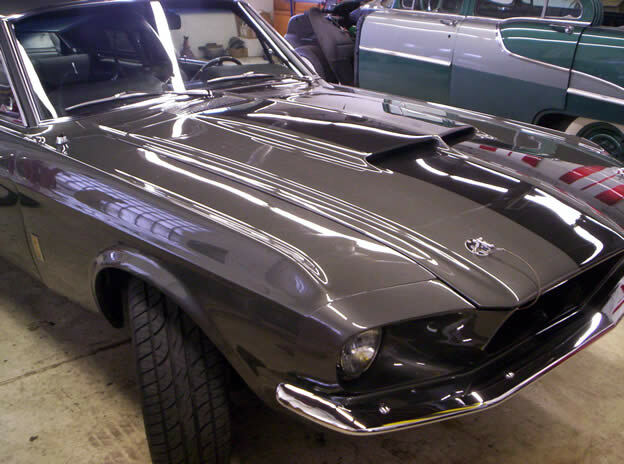 Mustangs & More is Kansas City's most complete resource for Mustang restoration or classic car restoration and we're centrally located only one block west of I-35 at Johnson Dr. in Merriam, KS . We even do a free 30-point check on your car any time you come in for anything, including a simple oil change. With so many great services, it's easy to see why our customers keep coming back.